Regional data control is included in the new enterprise service. 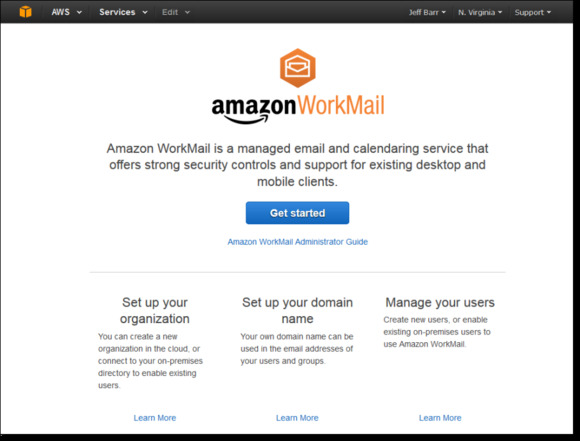 After nearly a year in preview, Amazon’s WorkMail hosted email and calendar service for enterprises is now generally available for $4 per user per month. Along with 50GB of mailbox storage for each user, the service includes features such as encryption of stored data, message scanning for spam and virus protection, and policies for controlling mobile devices. Many of those features were outlined when the product was first announced, but several new ones were added during preview as well. Of particular note is regional data control, which makes it possible for companies to choose where they want to store their mailboxes and data. In light of the recent death of the Safe Harbor agreement, that could be especially important for users in Europe. A newly added migration tool, meanwhile, aims to make it easier for enterprises to move their existing mailboxes over to WorkMail. Companies that use WorkMail in conjunction with Simple AD can generally be up and running on the new service in 10 minutes or less, Amazon says. WorkMail also now supports clients that run on OS X, including Apple Mail and Outlook, and those that use the Microsoft Exchange ActiveSync protocol, including iPhone, iPad, Kindle Fire, Fire Phone, Android, Windows Phone and BlackBerry 10. Companies can use it to create and book resources such as meeting rooms and equipment as well. WorkMail has achieved several key ISO certifications over the past year, and email administrators can use AWS Key Management Service (KMS) to create and manage the keys that are used to encrypt data at rest. Based on Amazon Web Services, WorkMail is now generally available in three AWS regions: US East (Northern Virginia), US West (Oregon) and Europe (Ireland). Looking ahead, Amazon is working on interoperability support that will allow users of WorkMail to have a single global address book. Also in the works is an email journaling feature through which companies can use their existing email archiving system to capture and preserve all Amazon WorkMail communication.